Even though the theme is "Constant/Chronic Evolution" I will use the boxy theme solely for my art style. Imagine Space Invaders where you can go forward and back as well. The level has strips that determine the level of power-up you can have. Hence the further you go (or closer you get to the enemy) the better power-ups you are granted. However, enemy will be tougher. As for progress, I have a ship that shoots and a single boss that shoots at you with very simple bullet patterns; which I better change if I want to deliver the gameplay idea. Your ship power-up or power-down depending of the background color where the ship stands. Sorry, but it has only one life and you have to restart the game. Sorry, but not sound implemented. Sorry, this game is rubbish, I know. Thanks for "playing" it in advance. Cool, glad to see you entering! Wow! Can't believe we're in the second week already! While working on my prototype I found some silly limitations in my mini-engine. I fixed them then I realized I can improve some modules and went and spend some time on it! Typical problem when you work on top of a half finished piece of software. Please, someone tell me is a waste of time and keep on working on my prototype! I'm experiencing serious problems making my game idea work. It doesn't feel right and still lots to do. Eh, don't sweat it. You should see what I've got to post. 1. indone - Adj. To achieve less than expected. Opposite of outdone. ex. His game had less to it than any of the others. They were indone by his attempt. Oh no! My game is totally unplayable! What should I do? Submit it as it is now? How long do we've got before deadline? Oh no! My IDE just crashed and it refuses to run again? Panic! Ok, restarted PC. It works now... back to coding. PS: How can I attach a file? I did once but couldn't find the option anymore...? I think the concept works really well. Perhaps you could make the top colors fire backwards. 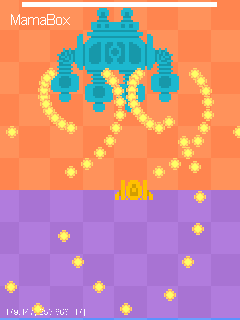 I also really like the way the background and the boss moves relative to your movements. It's a small thing, I know, but it really feels "right" for this game. Yeah I was gonna say the same thing with the background movement. How did you do that? Yes, it was meant to be a third power up (yellow colour) but it didn't make it. That's why the boss doesn't go higher and leave some room for the player to move up there. The third power-up was actually sort of 'guided missiles', but with a wide aperture so the player will try to get in the correct position to hit the boss, which should be attacking at its apex. And a the very top blue color again forcing the player stay within the yellow band to get hihger score. So when upgrading power-up on the yellow zone it actually loads orange power up again. Didn't have the time to implement the third one. I guess inverting the direction of the shots, as you suggested, would have been enough. It's only a cross multiplication, where the *camera*'s position is located within world dimensions relatively to the player position within screen position (i.e. form screen coordinates to world coordinates). The boss is attached to a kind of spring to keep it at the same hight in screen coordinates, but when it reaches a mark position in world coordinates, the spring stops working, so its position is fixed. Show general stats for rekcah. I really like this power up idea! It was hella fun to play. I beat the boss too btw!